This show is a benefit for our good friend, and avid gamer, David A. Croach â€œDACâ€, who was recently diagnosed with leukemia. Half of the door profits with be donated to DAC and his family in search for a perfect-match bone marrow transplant. For more information on how to help/donate or how to get tested to see if YOU are a perfect match for DAC, please check out his site! Cinco De Chipo, held at Union Hall in Brooklyn, looks incredibly promising with action-packed performances from various artists featuring chiptune/dubstep/electro sets ofÂ Dj CUTMAN and KNIFE CITY, a one-of-a-kind chiptune violin performance by Fluxer, ’90s pro-wrestling inspired chiptune music byÂ Heavyw8bit, andÂ dark and dramatic ’60s-inspired stylings from PROM QUEEN. The event is restricted to those who are 21 and up with a $5 cover. 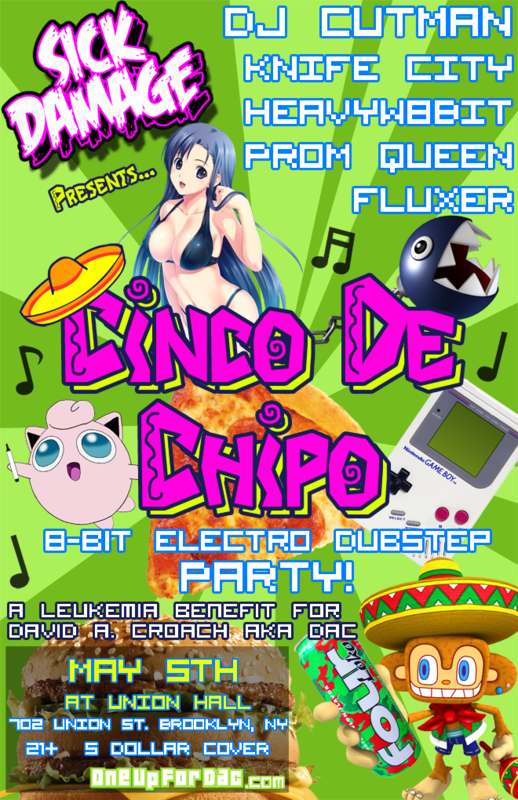 You can find more information on the event on Sick Damage’s Facebook, but be sure to check out the Cinco de Chipo event page to RSVP for one of the most thrilling Cinco de Mayos yet! Calling itself a “hybrid event that fuses together the powerful appeal of anime with the high energy entertainment of video games”, T-MODE, also known as Tournament Mode, is a anime and gaming convention in theÂ Washington, DC metro areaÂ that celebratesÂ the fusion of anime, gaming, music, cosplay, and all things otaku. This year, T-MODE will commence this weekend, Friday, April 20th until Sunday, April 22nd. Yes. Yes, we know. We’re actually writing about a gaming and anime convention. However, what sets T-MODE apart from other gaming and anime conventions are the panels dedicated to chiptune and DJing by none other chiptune wunderkind Inverse Phase and video game DJ mastermindÂ Dj CUTMAN. From learning how to spot fake chiptunes to being educated on the art of laptop DJing, these dudes have you covered. You can even learn how to write your own Nintendo music! While the pre-registration deadline for T-MODE has already passed, those in the Rockville, MD area can still register and buy tickets at the door — 1-Day and 3-Day memberships are available for $35 and $55, respectively. Don’t miss out on this cool opportunity to learn how to make and mix music from some of the pros.